Concrete kitchen countertops are getting some serious traction among many designers because you can literally do anything with them. You can form them into any size and fantastical shape, paint it any color, integrate a sink, and put in seashells, gems…the world is your oyster. It is a disaster, really, because homeowners already have so many options when it comes to kitchen countertops. One more trendy material is not going to help. However, since it is trending, it is probably a good thing to look more closely into this new material. Here are the pros and cons of concrete for kitchen countertops. Concrete has been around for a long time, although until lately it has been mostly something you keep under a thin layer of mortar or a veneer of wood, brick, or stone cladding. Today, concrete is a primo option for countertops. The basic mix is still the same and it is just as durable as the concrete on your driveway or the foundation of your home. However, modern colorizing and staining techniques has made concrete the base for fabulously beautiful countertop, especially when created by an experienced artist. Concrete is the base, and you can do literally anything with it. You can make any design, texture, and color with it, and you can mix materials with it to create a truly unique countertop. 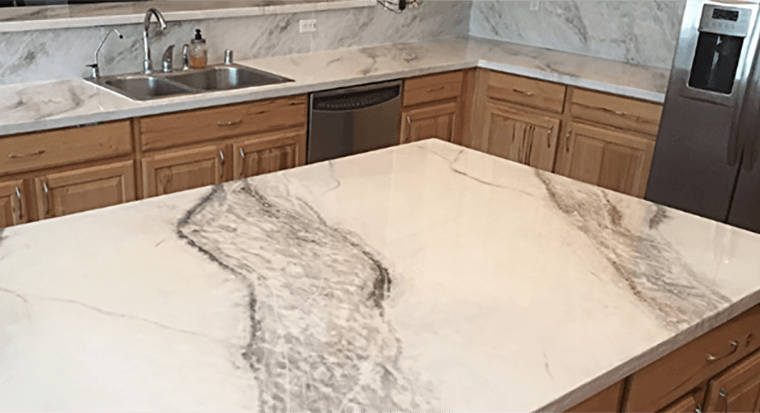 Some critics have a problem with it simply because it is not a natural stone like granite, but it has one thing in common with granite: you will never find another concrete kitchen countertop that is the same to your own. As you might imagine, concrete is super tough and heat resistant. It is the perfect material for kitchen countertops in that sense because it can take a lot of use and abuse. Concrete is an interesting option for the adventurous homeowner and designer. However, it has many issues that might discourage most people from considering it for their own kitchen countertops. Concrete kitchen countertops are expensive! A typical one will set you back a minimum of $7,000, installed, for a 100-square-foot counter space. It is much more expensive than granite or even quartz countertops, and most people are not willing to shell out that much, even if it looks fabulous. In fact, if you choose a truly nice one, it can go up to $12,000 or more. You might be thinking that can’t be right. However, there are actually good reasons for the high price tag. Concrete countertops are either preformed or poured onsite, and in either case, it takes nearly a month for it to cure properly. If you put in some special features, that waiting time for final installation and finishing can stretch for much longer. When you have concrete in your driveway, you hose it down occasionally and consider yourself done. However, as kitchen countertops, you need to do a lot more than hose it down. In fact, you need to seal it at least once a year, and apply a special wax at least once a month to keep stains away. You can’t even use just any cleaning products you want. Similar to marble and granite, you cannot use anything too abrasive because you can damage or strip away the protective covering that keeps the concrete resistant to stains. Stains are the number one enemy of concrete countertops. Quartz countertops are manmade and nonporous. Concrete is also manmade, but it is more porous than granite. This should be no surprise as concrete driveways often show signs of porosity such as oil and water stains, as well as weeds growing out of them. The only way to sort of seal concrete is to put down a thin layer of thin cement over it. If you have a concrete countertop, you will also have to seal it or it will stain like nobody’s business. It will absorb all sorts of spills, including non-liquid ones, and over time, it may even start to breed bacteria without a sealant. Even then, concrete will never be complete stain resistant. It will look quite messy and unattractive with its splotches and stains. If you are looking for the sleek, polished look of granite, marble, or quartz countertops, you are looking in the wrong place. There are two methods for installing concrete countertops in the home. One is by pouring it into a mold onsite and waiting for it to cure, or to use a pre-molded one that rather defeats the purpose since it will probably not be unique. At any rate, the problem with pouring the concrete onsite is that it has tendency to settle as it cures. This can lead to the development of hairline cracks, especially if it shifts at any time while curing. Pre-molded or pre-cast concrete slabs are less likely to develop cracks, but not impossible. To minimize this, installers usually put in some type of reinforcement prior to pouring the concrete to give support to the structure. However, concrete is extremely heavy, so it takes quite a bit of work to transport a precast countertop without damage. Fortunately, hairline cracks are hardly visible, especially if the design is particularly elaborate. They are also easy to repair. However, this is still an issue you are not likely to encounter with granite, marble, or quartz countertops. People are always excited about something new and concrete countertops are having a bit of a run with the kitchen design and renovation crowds. However, it is unlikely it will maintain its popularity because there are just so many issues with it, not the least of which is the high price. If you are looking for an easier and more affordable build, you should stick to quartz or granite for your kitchen countertops. Get in touch with a reliable countertop specialist in your area for a quote. KNC Granite is just the one for you if you are in the cities of Baltimore, Annapolis, Bethesda, Rockville, Washington DC, Alexandria VA, and Arlington VA.
We carry some of the top brands of engineered stone, including Cambria, Caesarstone, Silestone, and MSI, all of which come with manufacturer warranties. If you prefer natural stones, we also carry a large array of granite slabs from which to choose. You can check actual slabs at our showroom in Lanham, Maryland. We are also experts at fabricating and installing kitchen counters or bathroom vanities, and specialize in kitchen remodeling and bathroom upgrade projects. We deliver on time and on budget.